Simeon W. JONES [Parents] was born on 7 Feb 1822 in , Granville, North Carolina. He died on 21 Apr 1896 in , Bedford, Tennessee. Simeon married Lucinda Jane PRIMROSE on 12 Feb 1843 in , Bedford, Tennessee. Lucinda Jane PRIMROSE [Parents] was born on 2 Aug 1824 in , Granville, North Carolina. She died on 27 Feb 1899 in , Bedford, Tennessee. Lucinda married Simeon W. JONES on 12 Feb 1843 in , Bedford, Tennessee. M i Francis Paul JONES was born on 24 Jan 1844. He died on 25 Sep 1926. M ii Jeremiah Jennings JONES was born in 1846. He died in 1900. Susan Elizabeth JONES was born on 7 Oct 1850 in , Bedford, Tennessee. She died on 1 Aug 1878 in , Bedford, Tennessee. William James JONES was born on 15 May 1852 in , Bedford, Tennessee. He died on 11 Nov 1924 in , Bedford, Tennessee. James JONES was born in 1853 in , Bedford, Tennessee. Parthena A. E. JONES was born on 10 Jun 1855 in Pedukah, Livingston, Kentucky. She died in , Bedford, Tennessee. M vii Simeon Albert JONES was born on 5 Jan 1857. He died on 28 Jul 1902. M viii Robert H. "Bob" JONES was born in Nov 1858. He died in 1930. Thomas G. JONES was born in Nov 1860 in , Bedford, Tennessee. He died in 1903 in , Bedford, Tennessee. M x Columbus E. JONES was born on 6 Oct 1863. He died on 11 Feb 1932. M xi Moses Meade JONES was born on 31 Dec 1866. He died in 1930 or 20 Jan 1953. John Wiley BUNTING [Parents] was born on 28 Nov 1855 in , Bell, Texas. He died on 7 Apr 1944 in , Comanche, Texas. John married Sila. Sila. Sila married John Wiley BUNTING. George Washington BUNTING [Parents] was born on 10 Jul 1857 in , Bell, Texas. He died in 27 Jun 1943 or 7 Apr 1944 in Weed, Otero, New Mexico. He was buried in Possibly Greenville, Hunt, Texas ?. George married Susan Lenora BOOTH on 10 Jan 1882 in , Kerr, Texas. Susan Lenora BOOTH [Parents] was born in Nov 1864 in , , Oregon. She died after 1930. Susan married George Washington BUNTING on 10 Jan 1882 in , Kerr, Texas. James BUNTING was born on 19 May 1884 in , , New Mexico. He died on 19 May 1884 in , , New Mexico. 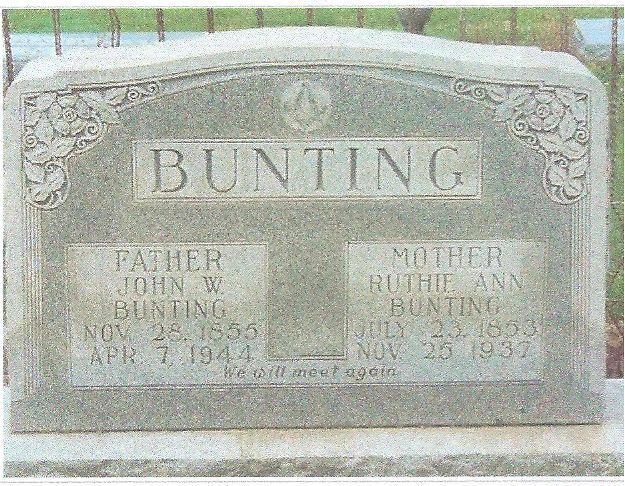 John BUNTING was born on 18 May 1885 in , , New Mexico. He died on 18 May 1885 in , , New Mexico. Frederick BUNTING was born on 7 May 1886 in , , New Mexico. He died on 8 Jan 1894 in , , New Mexico. Mary BUNTING was born on 1 Apr 1888 in , , New Mexico. She died on 1 Apr 1888 in , , New Mexico. F v Emily Marcella BUNTING was born on 28 Apr 1890. She died on 9 Feb 1967. Frank BUNTING was born on 4 Jul 1893 in Weed, Otero, New Mexico. He died on 16 Jul 1967 in Henrietta, Clay, Texas or Wichita Falls, Wichita, Texas. Albert BUNTING was born on 10 Feb 1899 in , , New Mexico. He died on 28 Sep 1964 in Henrietta, Clay, Texas. BUNTING was born in 1902. Hyrum Washington MIKESELL. Hyrum married Susan Lenora BOOTH. Susan Lenora BOOTH [Parents] was born in Nov 1864 in , , Oregon. She died after 1930. Susan married Hyrum Washington MIKESELL. James David "JD" BUNTING [Parents] was born in Dec 1861 in , Bell, Texas. He died on 5 Mar 1932 in El Paso, El Paso, Texas. James married Martha Elizabeth "Mattie" PRATHER in 1889 in Weed, Otero, New Mexico. Martha Elizabeth "Mattie" PRATHER was born on 16 Jul 1862 in , Van Zandt, Texas. She died on 29 Mar 1958. Martha married James David "JD" BUNTING in 1889 in Weed, Otero, New Mexico. Dock Guy WALLACE was born on 14 May 1884 in Clebourne, Johnson, Texas. He died on 20 Sep 1972 in Big Spring, Howard, Texas. He was buried in Big Spring, Howard, Texas. Dock married Maggie Jane MARCHBANKS. Maggie Jane MARCHBANKS [Parents] was born on 28 Mar 1887 in Cleburne, Johnson, Texas. She died on 1 Jul 1915 in Big Spring, Howard, Texas. She was buried in Big Spring, Howard, Texas. Maggie married Dock Guy WALLACE. Francis Paul JONES [Parents] was born on 24 Jan 1844 in , Bedford, Tennessee. He died on 25 Sep 1926 in , Bedford, Tennessee. He was buried in Jones-Hayes, Rutherford, Tennessee. Francis married Mary Ann CRICK in Sep 1864 in , , Tennessee. Mary Ann CRICK was born on 12 Nov 1840 in , , England. She died on 18 Sep 1905 in , , Tennessee. Mary married Francis Paul JONES in Sep 1864 in , , Tennessee. M i John Wesley JONES was born on 16 Jul 1865. F ii Cynthia Tennessee JONES was born on 19 Mar 1867. She died in 1959. F iii Alice JONES was born on 4 Jun 1869. M iv Francis Edmond JONES was born on 2 Jul 1871. M v Lemuel Lafayette JONES was born on 12 Feb 1874. He died on 8 Feb 1945. F vi Lucinda JONES was born on 6 Aug 1876. M vii William Thomas JONES was born on 5 Jul 1879. He died on 7 Feb 1935. James "Jim" JONES was born on 14 Aug 1880 in , , Tennessee. NEWMAN. NEWMAN married Alice JONES. Alice JONES [Parents] was born on 4 Jun 1869 in , , Tennessee. Alice married NEWMAN. John Wesley JONES [Parents] was born on 16 Jul 1865 in , Rutherford, Tennessee. John married Martha Jane HORTON on 3 Jul 1884 in , , Tennessee. Martha Jane HORTON was born on 20 Jul 1860 in , , Tennessee. She died on 4 Jul 1934. Martha married John Wesley JONES on 3 Jul 1884 in , , Tennessee. M i William Anderson JONES was born on 16 Jan 1885. He died on 25 Jul 1949. F ii Nora Ann JONES was born on 10 Apr 1887. She died on 7 Sep 1925. M iii Francis Paul JONES was born on 15 Mar 1889. He died in 1967. M iv Houston Horton JONES was born on 21 Jul 1891. He died on 16 Jan 1969. Pearl JONES was born on 11 Mar 1894 in , , Tennessee. She died on 9 Aug 1898. M vi Hobart McKinley JONES was born about 1897. F vii Mattie Belle JONES was born on 1 Oct 1899. Iretta JONES was born on 17 Oct 1902. She died on 28 May 1903. Hobart McKinley JONES [Parents] was born about 1897 in , , Tennessee. Hobart married TOMLINSON. TOMLINSON. TOMLINSON married Hobart McKinley JONES.